Let our Coast-Guard licensed captains take you! 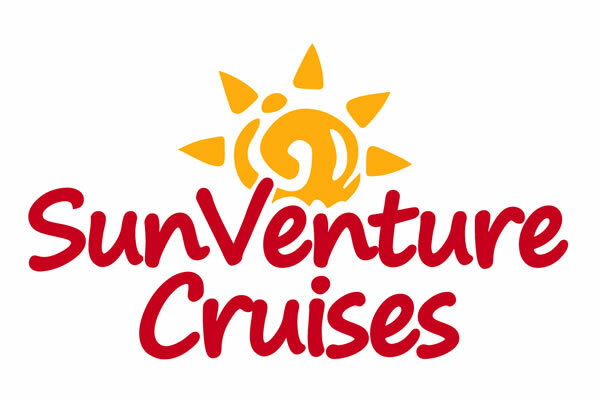 SunVenture Cruises specializes in memorable water adventures that are relaxing, fun and more affordable than a boat rental. Experience the difference of our Okaloosa Island and Destin cruises. Our captain drives the boat while you relax on an open-air Catamaran with full-access to a restroom and shade for your entire cruise. Choose from two cruise schedules. Options include our Destin cruises from the Harbor on the SunVenture I Catamaran or the SunVenture II Catamaran, located 5 miles away at Island Time on Okaloosa Island. Both offer daily chartered cruises including Crab Island Cruises, Sunset Dolphin Cruises, Sunset / Fireworks Cruises and Private Cruises. Don’t see your desired cruise or time? Make sure to check cruise schedules at both locations for availability. 2 hour Sunset, Dolphin & Destin Harbor Fireworks Cruise; every Thursday night in the summer. You must check-in 30 minutes prior to the scheduled cruise time at your correct location. Make sure you have the correct address for your location and plan for ample time to arrive. Allow extra time for traffic and parking during the summer peak season. If a cruise is missed for any reason, the credit card on file will be charged for the full amount. Have your cruise email confirmation available on your smartphone or have a printed copy of your boarding pass. Personal carry-on bags are allowed on board but they must be able to be stored under your seat. There is a chance of getting wet on your cruise, so plan accordingly. We do not take responsibility for lost, stolen or damaged items brought on board. For a complete list of things to take on your Crab Island Cruise, click here. For a complete list of things to take on your Dolphin Sunset Cruise, click here.